CAIRO - The pan-Arab broadcaster Al-Jazeera is calling out for help from Egyptian bloggers and others after authorities closed its Cairo office amid unprecedented anti-state protests. A statement by the Qatar-based network urges Egyptians to send blog posts, eyewitness accounts and videos to expand coverage of the uprising against President Hosni Mubarak. Monday's appeal comes a day after Egyptian authorities shut Al-Jazeera's office, complaining its round-the-clock coverage was slanted toward protesters and could encourage more unrest. 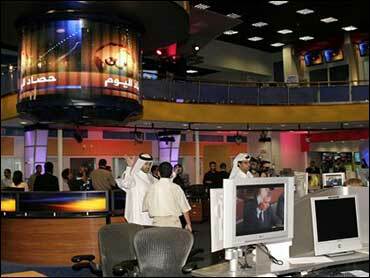 Al-Jazeera denounced the move as an attempt to muzzle open reporting. It has managed to continue coverage in Egypt with fixed-position cameras and reports by phone. Al-Jazeera has given nearly round-the-clock coverage to the unprecedented uprising against Egyptian President Hosni Mubarak with what is probably the most number of reporters on the ground of any network. Al-Jazeera's flagship Arabic channel has faced numerous bans and backlash across the Arab world, including bitter complaints this month from the Palestinian Authority over allegations that its reporting favored rival Hamas over leaked documents about peace talks with Israel. Al-Jazeera also broadcasts in English. But the ban by Egyptian officials comes amid one of the most pivotal Arab political showdowns in decades and a possible watershed moment for Arab networks expanding their presence on the web and social media. The blanket coverage offers another example of how border-spanning outlets such as Al-Jazeera and the worldwide reach of the Internet have destroyed the once-unchallenged control of media by governments. Al-Jazeera called the Egyptian ban "an act designed to stifle and repress the freedom of reporting by the network and its journalists." "In this time of deep turmoil and unrest in Egyptian society, it is imperative that voices from all sides be heard," said the statement from its headquarters in Qatar's capital Doha. "The closing of our bureau by the Egyptian government is aimed at censoring and silencing the voices of the Egyptian people." The network promised to continue its coverage, and Monday's call for contributions from the public via Twitter and other social networking tools was a clear indicator that it hoped to do so with the help of its own viewers. It said Al-Jazeera journalists would provide updates on Twitter. The network had previously posted clips from broadcasts on YouTube.